Leach pinpoints "the increasingly hostile and ad hominem tone of national politics" characterized by "anger and name calling" that "damage our social cohesion. "...Recognizing you in me and me in you would be a first step toward making mutual plans for a better future, toward moving forward in mutual respect. A first step toward bringing decency and humanity back into our public actions, before it is too late. The president seeks to rally the nation with a prime-time address. A menacing House Speaker John Boehner follows, pulling out a golf shoe, hammering it on the lectern, and implies that unless the White House and Senate capitulate to Republican demands, in so many words: "We will bury you." As President Barack Obama said Monday night, the voters asked for a divided government, not paralyzed government. Fiscal jihadists in the House are dedicated to the latter, with belts of explosives hugging their hips. Way to go, Austin American-Statesman. I'm so proud that my local paper doesn't promote any name-calling or hostility. I assume by now everybody has heard more than enough of the News of the World phone-hacking scandal and its subsequent shut down. I just want to mention that this morning an article in the paper gave me a brilliant idea. It seems the Taliban are claiming that text messages announcing the death of Mullah Omar are false and that somebody has been hacking into their phones. I have no idea about the truth of this, but it does seem to me that hacking into the Taliban's phones would be a Good Thing with lots of possibilities for causing dismay and disruption. And since we suddenly have all these unemployed journalists with much experience along these lines....couldn't Britain install them all at, say, Bletchley Park, and set them to work serving their country? Today I love this quilt by dellastella; first because I'm shooting for a dimensional effect in my next bed quilt (of which more later) and second because the image of blocks falling out of the sky and piling up uncontrollably (at least, that's what happens when I play Tetris) seems like a perfect metaphor for our financial dilemma. Now why would I think that none of the pundits have a clue? One thing for sure - they can't all be right. I am somewhat annoyed that we're sinking into a bottomless sea of debt and the folks on Capitol Hill seem to be interested in pointing to the other guy and shouting, "It's his fault! Look, people. If I'm about to drown, how about you stop arguing about who pushed me overboard and somebody throw out a life preserver? 1) We've been told and told and told that Social Security funds really do exist, inside a sacred lockbox that is never ever opened for any other purpose. Now Obama says we may not have funds to cover Social Security in August. I wonder who's lying? 2) Historically, tax revenues have hovered at around 20% of GDP. So I'm not at all sure that tax increases would produce more tax revenues. Eliminating, say, the Department of Education would certainly result in less spending. Not that it matters, because Armageddon is coming on August 2... or is it? Faites vos jeux! Now this would have been more creative than simply putting the stuff in sacks for the Elder Spawn's yard sale. On the other hand, I didn't have anywhere near that much yarn. 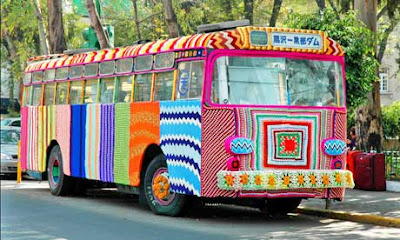 I might have been able to yarnbomb a chopped Harley, but not a bus. This week's excuse for not getting much done is that the Younger Spawn, aka the Fashionista, is favoring us with a visit from New York. Today the two of them are off having a Sister Day so I went to Barton Springs...ah. They're back, looking all tan and sleek. They went to Barton Springs too, but later in the day, so they got in on the excitement. Apparently the lifeguards started blowing their whistles and screaming, "Get out of the pool! Get out of the pool!" which never happens there. Then all the lifeguards dived in and went underwater. Apparently somebody had lost track of a child. That's a big pool. And much of the bottom is covered with water weeds. If it had been my child, I'd have had a heart attack. Happy ending: they report that the missing kid reappeared safe and relatively dry, having (I assume) simply wandered off somewhere else without mentioning it to the parent. There are enough sloping green banks and trees and bushes around that pool that a child can easily disappear without ever going near the water. Nothing exciting like that ever happens when I go swimming. Probably just as well; see heart attack, above. The Austin American-Statesman has come to the rescue of us fireworks-deprived people in thirsty Texas* with an interactive virtual fireworks show. No, really. Check the link. They do suggest that for a really good simulation of the Independence Day show you should first turn off the air conditioning to get the full experience of being outdoors on a July night; then, after watching the virtual fireworks, go sit in your car for 45 minutes to simulate the post-show traffic jam. I think I'll stay in the AC and re-read the Declaration of Independence. It still reads pretty well. You tell 'em, Mr. Jefferson. I hope that, as a country, we still have the collective spine demonstrated by the 56 gentlemen who signed this document, many of whom paid dearly for having done so. Some time after writing the previous post, it occurred to me - not that it matters - that I'm probably not getting my eyes checked tomorrow. The optometrist's office probably won't even be open tomorrow. Reset alarm clock for Tuesday morning. Bartender says, "I give up, it's never going to rain again." First man in the bar says, "I'll bet you twenty-five bucks you're wrong." They shake on it and first man leaves. Second man in the bar says, "Are you crazy? There's no way you can win that bet." Bartender says, "No, you're crazy; I've collected on that bet three times already." It's never going to rain again. ...is that it's really, really hard to see. 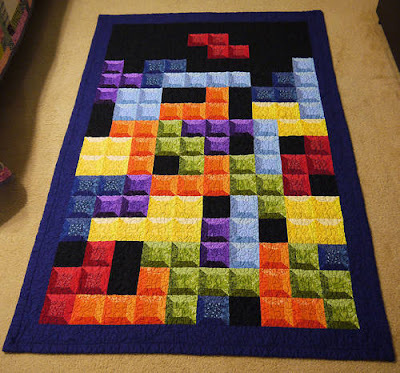 I will bear this in mind next time I machine-quilt something. Is the time it takes to change threads for different areas of the quilt really more of a nuisance than constantly chasing a thread that's so fine I can't see what I'm doing? Heck, a lot of the time I had trouble seeing the quilted line. It's easier now that I've worked my way down to the bottom of the quilt, where there's a layer of Solvy covering the top layer of corals. 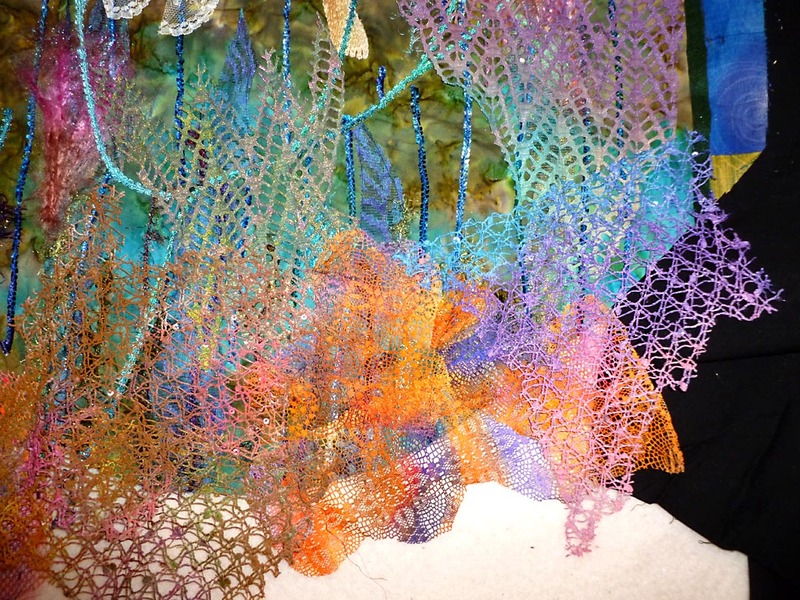 Still, I'm looking forward to a switch to brightly colored threads as I do some FME to finish the bottom edge. Meanwhile, I'm getting my eyes checked tomorrow. Although I suspect the doctor will tell me the current prescription is already as good as it's going to get and the only problem is that I'm OLD. It's hell getting spare parts for something that was made in 1947. I got a 27, which isn't disgraceful for someone over 60, but I had expected to do a lot better.